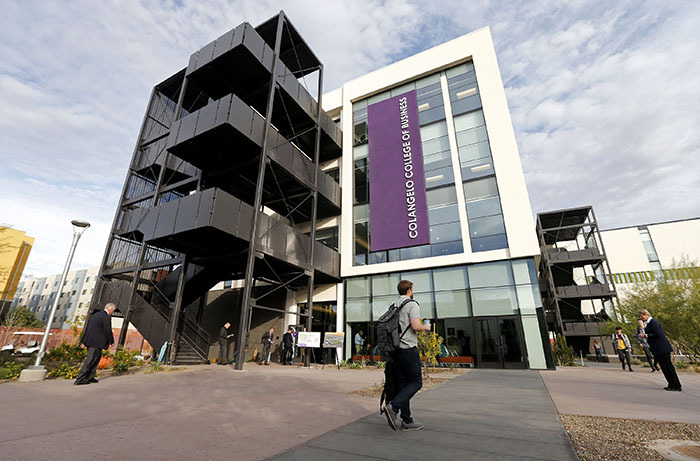 PHOENIX (Jan. 9, 2019) – One of the largest business schools in the country now has a new home on Grand Canyon University’s burgeoning campus. More than 1 million square feet of classroom, laboratory and office space. The Colangelo College of Business is among the largest business schools in the country, with approximately 4,100 students pursuing degrees at the Phoenix campus and more than 12,000 attending classes online. In 2010, those numbers were approximately 300 and 7,000, respectively. That business college growth mirrors the enrollment spike as a whole at GCU, which has grown from less than 1,000 traditional students in 2008 to 20,500 today on its 260-acre Phoenix campus. That’s in addition to more than 75,000 students studying online. GCU’s business college was named after Colangelo in 2014 in honor of an icon who has been among the most influential people in Arizona since 1968, when he joined the Phoenix Suns as the youngest general manager in professional sports at age 28. Colangelo later led the ownership groups of both the Suns and Arizona Diamondbacks, becoming one of the most prominent businessmen in the NBA and MLB; helped bring hockey to the Phoenix area when the Coyotes moved here from Winnipeg; and has been director of USA Basketball since 2005, helping Team USA re-establish its dominance in international men’s basketball. He also shaped the Phoenix skyline, transforming the downtown corridor into a vibrant business community. Colangelo has been involved with GCU since 2009 as a board member, advisor, the namesake for the Colangelo School of Sports Business, and for the past four years as the namesake for the entire Colangelo College of Business. He has worked alongside the university to create a business program rooted in academic excellence and real-world relevance, with a focus on servant leadership designed to hone students’ business skills and prepare them to become values-driven leaders. CCOB Dean Dr. Randy Gibb said Colangelo serves as a consultant for faculty and staff in helping evolve the college while also leading a CCOB Advisory Board comprised of 53 Phoenix valley business leaders. He also makes a point to engage with students, drawing upon his personal values and extensive background to enhance the learning experience. Colangelo is well-known for his work to improve lives in the community, another trait he shares with the university. GCU’s five-point plan to transform the inner city in which it resides has seen remarkable results in the areas of K-12 education, neighborhood safety, home values and job creation both on and off campus. It is also seen in the economic impact of the university. A 2015 study performed by Elliott Pollack & Company found that GCU provides an annual economic impact of $1.1 billion to the Phoenix area while being responsible for more than 10,000 jobs with wages totaling $487.7 million and generating an estimated $450 million in city, county and state tax revenue per year.